The video shows the Crescendo Cycling Brass Band from the village of Opende, just a few km from here. They formed in 1973, taking over the activities of a former military bicycle band. There's an Assen connection in that the first performance took place here in Assen at the TT race (Assen has a famous motorcycle racing circuit). It's really very impressive how they ride in formation while playing their instruments. You'll note that specially adapted bikes are used for many of the musicians so that they can, for instance, drum and steer at the same time. The bikes used have back-pedal / coaster brakes. 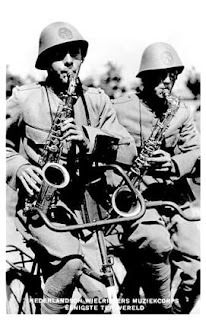 The photo on the left shows the Nederlandsch Wielrijders Muziekcorps just prior to the second world war. Click on the photo for some more images. Many thanks to Mark Wagenbuur for suggesting this video. I've written before about the cycle parking at Assen railway station. How it is to grow to 2300 cycle parking spaces this year or enough for one in 28 of the population to leave their bike at the station. This time I'm covering it from a different angle. There is also car parking the railway station. You can see cars parked at the far end of the cycle park in this photo. They are in a position a bit further from the platform and ticket office than the cycle parking. At present there are 40 car parking spaces at this location and a similar number on the other side of the tracks. There is only room for around one in 800 residents to drive to the station, and 15 of these spaces are being lost this year to make room for more cycle parking spaces. The car parking is inexpensive to use, though with the limited spaces I suspect that drivers can find it difficult to get a space. It's an example of carrot rather than stick. People are being encouraged to cycle by choice for the sake of convenience, not charged out of their cars. The bus station is adjacent to the railway station, so it is also convenient to combine bus journeys with train journeys. You can see a video of walking from the railway platform to the cycle park in the photo here. Yesterday I went to collect some more front bicycle racks, which sell quite well especially combined with a basket for people to carry their dogs on their bikes. I took the same 40 km route to Hoogeveen to collect the racks as I've taken on several other occasions, but came back by a longer route to explore some places that I'd not been before, and get some more ideas for holiday routes. We've more routes this year than last, and have been able to refine some of the routes that people took last year. 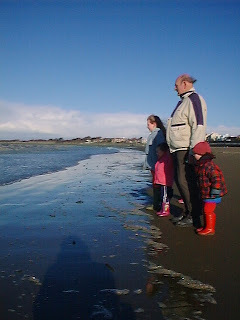 That's me in "Engeland" (the Dutch spelling for England). It's a small village just a few km south of here. Unfortunately, "England" was a bit of a washout. It was a bit too small even to have a sign to announce its existence, so I could not take a photo next to a sign post. The BOB YAK trailer basket contains 9 racks, and there are a further three in the rear basket on my bike. I had this 35 kg load for the 55 km return journey. The road at this location seems to be in the process of being narrowed. This is in accordance with the policies generally to reduce speeds in the countryside. This was the only car I saw on this section of road, and it stopped on the temporary passing place to let me go by. In general, car drivers are discouraged from using small country roads in this area. The sign in this heath area asks people to switch off their mobile phones in order to avoid interference with a radio telescope which operates here. The heath is also offically a "Stilte Gebied", or "Silent Area" in which there is generally no sound other than that of nature. We've quite a lot of these areas around here. It's really great to be able to ride in places where you can't hear motor vehicles. And here is the radio telescope in question. This is one of a number of telescopes in the area, all of them now linked together in an international effort called "JIVE". There are many such areas of heath in the area. "JIVE" is a really high tech project, based in the middle of the Drents countryside. A specialised supercomputer in this location receives information from telescopes across the world and combines it with clever software to give much the same result as that which would result from a planet sized telescope. Now a more traditional type of picture. One of the beautiful churches in the area. I passed through several small villages on the way home. Places that will definitely find their way into cycling holiday routes, and by the time I got home, the next dozen racks for stock had been on a great tour of the Drents countryside. Once home, I loaded up the Xtracycle and took some baskets (and a rack) to the post office. It's always a pleasure to cycle here, and this was once again a splendid day out. Also, you'll see how we really do use all the stuff that we sell. That goes not only for daily use of the bicycle baskets but also one of the racks was used to take parcels to the post office, and of course I spent half the day riding through the area in which our holidays are based: the same area as we selected to live in because it is so exceptional for cycling. Scene from a Dutch suburb built in the 1980s: The dreaded Bendy Bus. Many cyclists really dislike these, and they have been blamed for an increase of injuries in London. Quite apart from the real danger, it is quite obvious that the articulated nature of them leads to a reduction in subjective safety for cyclists, and we already know how important that is. Over here, buses rarely get close to cyclists as we're on the cycle path (red) while the buses are on the roads, with the speed bumps to try to keep them and the other motor vehicles under control. Note also the way the road rises up a little at the position of the crossing for pedestrians (and cyclists just off the right of the photo). Just enough to give drivers a hint that they should slow down at this location, but without causing cyclists (on the cycle path) any problem at all. Getting "knocked down by a bus" is not all that uncommon where buses are mixed in with cyclists. Large vehicles don't ever really mix very happily with bicycles, and that's one reason why I have never thought much of shared bicycle / bus lanes. The only time I've ever had to ride in a bus lane in the Netherlands, it had been converted into a bike lane because of road works. These photos are of public bicycle tool kits provided by the ANWB in the Netherlands. Both are on the outside walls of cafes, the first is near Assen (at the link you can see the beer company sponsored cycle parking and the nearby cyclepath as well as the toolbox). If you need to use the tools inside you can get a key from the cafe owner. The ANWB is the Dutch equivalent of the Automobile Association. The letters ANWB stand for "Algemene Nederlandsche Wielrijders-Bond" or "General Dutch Cyclists Union". The organisation that rescues broken down drivers in the Netherlands is actually a cycling organisation. They also put up many of the cycle route signs. In the 1970s there was a lot of criticism of the ANWB for no longer representing cyclists enough, which lead to the formation of the similar named ENWB ("Eerste Enige Echte Nederlandse Wielrijdersbond (ENWB)" - "First and only real Dutch Cyclists Union") which later changed its name to Fietsersbond ("cyclists union") and today campaigns for cyclists rights. The second photo shows another toolbox on the outside wall of a cafe near Eindhoven, in the province of Brabant several hundred kilometres from here. Note that this also has a "Fietscafe" (cycling cafe) sign. It's one of hundreds of fietscafes in the Netherlands. The province of Brabant, for example, has 200 Fietscafes. There are photos of other small things like this on the blog. "Fiets" is one of two words for bicycle in Dutch. The other being "Rijwiel", hence the name "Rijwiel hulpkist" for the public tool box. The UK newspaper "The Independent" just ran an article entitled "Eating ourselves to death". Obesity is rising fast in the UK. Deaths due to obesity have risen by 35% over five years, even though there is a lot of under-reporting (read the article). By the year 2050, the cost to tax payers of medical problems due to obesity through the National Health Service and other agencies is expected to rise to £50bn a year. That is a huge amount of money. Just maybe spending a small proportion of that sum on truly encouraging cycling might be a way of reducing this vast expense later on ? It's pretty obvious from walking down the road here that there are far fewer obese people in this country. It's also obvious that there are a lot more active people. In related news, the BBC recently had a story on how "Increasing activity levels in middle age can prolong life as much as giving up smoking". Another good reason to promote cycling. Dutch over 60s make a quarter of all their journeys by bike. They are relatively fit and trim, and they have a longer life-expectancy than British people - despite the higher smoking rate and availability of food as pictured here. 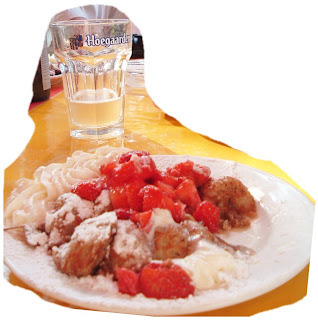 The image is of poffertjes (small pancakes served in this case with cream, strawberries and lots of sugar) and beer as eaten by a participant on one of our tours last year. Delicious, and not too unhealthy so long as you are getting plenty of exercise on a cycling holiday. I can't be the only person who thinks there is an awful lot of wishful thinking involved in the way that bike sharing schemes are reported. I think a bit of realism is needed about the capability of such schemes. I recently heard on the BBC news that London is to get 6000 shared bikes by 2010 and that the most optimistic estimates of their use say they will each be used 10 times a day. That's 60000 cycle trips per day (and is somewhat optimistic based on the take up of other shared bike schemes. update: as it turned out, London's bikes are actually used about a quarter so often so all my estimates below are actually wildly optimistic compared with real life). This may sound impressive, but the greater London area has around 8 million residents. In most places, people make an average of around 2.5 "trips" by all modes each day, so that's around 20 million trips per day in total. If we assume that the bike hire scheme really does reach the number of trips that its proponents say, this means it has a capacity to replace one in 400 trips. 0.3% of the total. And that's the best case if they complete the scheme. i.e. on average these bikes will account for just 0.002 trips per person per day. That's tiny. Barely a start, in fact. Where people really cycle they use their bikes an awful lot more than that. For example, here in Assen the population make just short of 1.2 bike trips per day (the population of 65000 make over 70000 trips, more than the total capacity of the London scheme). Up in Groningen that grows to 1.4 bike trips per day. The Dutch, who are only twice as numerous as Londoners, make more than 14 million trips per day by bike. London's estimate of 60000 trips per day may impressive, but it's not. It's more than two orders of magnitude short of what is required (2011 update: actual usage has been under a third of what was predicted, but the hype continues unchecked). It's great to see anything which encourages people to cycle. However, this scheme can never genuinely result in a large cycle culture. It can only ever be a small part of the picture. It seems to me that public cycle hire is being picked on by many cities largely because it's the smallest thing can be done which will make it look as if something is being done. No longer do you need to do anything complicated and expensive like re-arranging the streets to make them more suited for cycling, or risk alienating motorists as you do it. Just allow a company to set up doing bike hire and the world's press will be amazed by your achievement. How are other schemes doing ? Barcelona has a population of 1.6M and 6000 bikes. They claim each one is used 10 times a day, so that's enough for 1.8% of journeys. The Paris metropolitan area has 12M people, and there are 20000 bikes. Maximum capacity of Velib is therefore 0.8% of the journeys. What's more, the system in Paris is in trouble. To see successful policy you really can't look for inspiration to nations where virtually no-one cycles. The country to look to is the Netherlands, where there is the highest rate of cycling in the world. The Netherlands also has a public bicycle scheme called OV-Fiets. I previously covered the amusing promotional videos for the scheme. This has a different emphasis specifically targeting people who need bikes at the ends of journeys on public transport. (i.e. Exactly the opposite emphasis as London) and it is growing in popularity very quickly. But here also OV-Fiets can only cope with a very small proportion of total journeys. Can you believe that every one of the 20000 bikes provided in the Velib scheme in Paris has had to be replaced in the first two years ? In other news, a comparative study of Bike Share schemes around the world showed that none were proven to be effective at increasing modal share. Since this post was written, Ve-Lon was renamed and implemented as the "Barclays Cycle Hire" system. It is no more ambitious than ever, and will still not provide for more than a tiny fractional increase in cycling in London. The fact remains that London already had plenty of bikes, and plenty of people who would like to cycle. The lack of decent infrastructure stood in their way and still stands in their way. Actual figures for usage in London have turned out to be much lower than predicted while costs are higher than predicted . My remark above that 10 rides per day was optimistic has proven to be right. It's closer to three in reality. A later report from London pointed out that there's been no meaningful shift from car to bike and that a large proportion of total users are people who already rode bicycles in London. They use the shared bikes as insurance against their own bikes being stolen. Nevertheless, London has continued to hype the figures for the bike share scheme though usage has now dropped to just over 2 rides per bike per day. i.e. less than a quarter of the optimistic estimates. Regardless of this less than stellar success, other countries have gone ahead with their own bike share schemes rather than looking to the world's leading cycling nation and copying policies and infrastructure with proven success at increasing cycling modal share. London's "Superhighways" are another example of not doing remotely enough. Would you like to see true mass cycling for yourself ? Come on one of our Cycling Holidays or a Cycling Study Tour. Velomondial points to the latest version of the wonderful "Cycling in the Netherlands" document from the Fietsberaad. I highly recommend a read of this document. It contains a lot of statistics, but gives them in an easy to read form with some really wonderful photos. Commentators from elsewhere may be interested in this passage from page 71 (page 36 of the PDF file): "Wearing a bicycle helmet for daily trips is unusual in the Netherlands. Only competitive cyclists or mountain bikers tend to wear a helmet for their sport. Some parents give young children bicycle helmets. Usually the helmet is simply packed away for good before the offspring are 10 years old. There is certainly no support for mandatory helmeting. The fear exists that making it mandatory would cause a drop in bicycle use." Pushing of cycle helmets has recently been blamed for a reduction in cycling in Denmark. Policies here are still aimed mainly at increasing cycle usage by improving infrastructure to result in an improved experience for cyclists. This has been pursued to a greater extent than in any other country and it has succeeded to a greater extent than in any other country. Overall, the Netherlands still has by far the highest cycling rate with 26% of journeys by bike. Denmark is still in second place with around 19% of journeys by bike and by way of comparison, the English speaking countries all still have around 1% of journeys by bicycle. The photo shows bikes outside a village church last Sunday. This is a popular way of getting to church. Sadly, the Danish cycling rate dropped since this article was written. What happens when the cycle path has been dug up ? On the way home a bit earlier today the cycle path had been completely dug up. This is, of course, no bother at all to the Dutch cyclist as they can expect to be treated with respect by contractors. Alongside the cycle path in this location is a two lane road, which normally has one lane in each direction. Today the road is reduced to a single lane, and in using it drivers in the two directions have to negotiate. Cyclists have been given one of the lanes for full time use in both directions. Yet again, cyclists come first, and have the least disruption. Explanatory captions on the video are only visible when it is played on a computer and not on a mobile device. Cycling is always a reliable way to get about here. You don't find unpleasant surprises due to things like road works. It's all part of making sure that people always want to cycle. This is one of a number of posts which illustrate examples like this. Please view the videos of the other examples. I have other examples tagged road works. Also on the photos page there is a temporary bridge for cyclists. I don't usually put photos of car repair garages on this blog, but there's a reason for this one. I noticed as I passed today that there were bicycles inside this car dealership. I initially assumed that they'd be car company branded bikes, perhaps Volkswagen or Audi as this is the local dealership for those marques. However the answer turned out to be much more interesting than that. These are loan, or courtesy, bicycles. If you take a car in for repair and it needs to stay longer than you are willing to wait then you are offered a loan car for €12.50 per day or a loan bicycle for free. Since seeing this I've realised that these bikes are seen around town quite often, as are bikes on loan from other garages. It's obvious that quite a lot of people choose the free option of the bike as there are quite a few of them. Of course, virtually all of the population of this city are regular cyclists, and this seems like quite a normal thing for garages here to offer, so this won't be particularly out of the ordinary. The red writing reads "an old cycle park can stink badly in damp weather". It's part of an article in the latest issue of the Fietsberaad Fietsverkeer (cycle traffic) magazine. The magazine, printed in Dutch, makes quite amazing reading. This is but an example of the sort of issue which is discussed here, but which never was mentioned in discussions that I recall about planning or maintaining cycle parking in the UK. The article goes on to discuss lighting, colour schemes, music (or lack of, and a proposal for occasional poetry in order to make older cycle parking seem nice again), all in order to lead to cyclists having a pleasant experience that they will want to repeat. The next section, "Warm welkom," talks about red asphalt leading into a cycle park giving a warm feeling of being welcomed on a red carpet. Do you feel welcomed by the cycle parking where you live ? It is also, of course, necessary to have quite a lot of cycle parking. I've other posts on this subject.